ab32371 recognises Bak. The antibody does not cross-react with other Bcl2 members. Synthetic peptide corresponding to Human Bak aa 1-100. WB: Recombinant Human Bak protein (ab114337), HAP1, HeLa and HEK-293 cell lysates; human heart and fetal heart lysates. IHC-P: Human pancreatic carcinoma, stomach carcinoma and normal stomach tissue. ICC/IF: HeLa cells. IP: HCT 116 and HeLa cell lysates. Flow cyt: HeLa cells. Our Abpromise guarantee covers the use of ab32371 in the following tested applications. WB 1/10000. Predicted molecular weight: 23 kDa. For unpurified use at 1/250-1/500. Lanes 1 - 3: Merged signal (red and green). Green - ab32371 observed at 25 kDa. Red - loading control, ab9484, observed at 37 kDa. 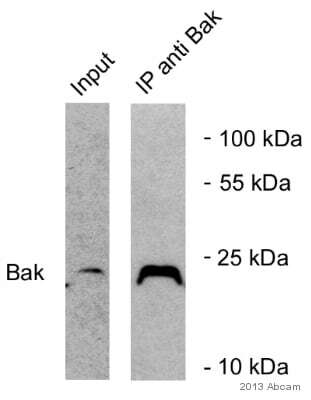 Unpurified ab32371 was shown to specifically recognize BAK in wild-type HAP1 cells. 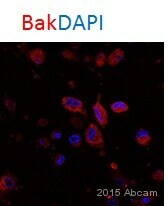 No band was observed when BAK knockout cells were examined. Wild-type and BAK knockout samples were subjected to SDS-PAGE. Unpurified ab32371 and ab9484 (Mouse anti GAPDH loading control) were incubated overnight at 4°C at 1/1000 dilution and 1/20,000 dilution respectively. Blots were developed with Goat anti-Rabbit IgG H&L (IRDye® 800CW) preabsorbed ab216773 and Goat anti-Mouse IgG H&L (IRDye® 680RD) preabsorbed ab216776 secondary antibodies at 1/20,000 dilution for 1 hour at room temperature before imaging. Immunocytochemistry/ Immunofluorescence analysis of HeLa (Human cervix adenocarcinoma epithelial cell) cells labeling Bak with Purified ab32371 at 1:100 dilution. Cells were fixed in 4% Paraformaldehyde and permeabilized with 0.1% tritonX-100. 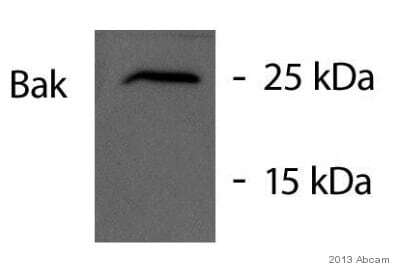 Cells were counterstained with Ab195889 Anti-alpha Tubulin antibody [DM1A] - Microtubule Marker (Alexa Fluor® 594) 1:200. ab150077 Goat anti rabbit IgG(Alexa Fluor® 488) was used as the secondary antibody at 1:1000 dilution. DAPI nuclear counterstain. PBS instead of the primary antibody was used as the secondary antibody only control. ab32371 (purified) at 1:20 dilution (2μg) immunoprecipitating Bak in HeLa (Human cervix adenocarcinoma epithelial cell) whole cell lysate. Flow Cytometry analysis of HeLa (Human cervix adenocarcinoma epithelial cell) cells labeling Bak with purified ab32371 at 1:20 dilution (10 µg/ml) (red). Cells were fixed with 4% Paraformaldehyde and permeabilised with 90% methanol. A Goat anti rabbit IgG (Alexa Fluor® 488) secondary antibody was used at 1:2000 dilution. Isotype control - Rabbit monoclonal IgG (Black). Unlabeled control - Cell without incubation with primary antibody and secondary antibody (Blue). Unpurified ab32371 staining Bak in the human cell line HeLa (human cervix adenocarcinoma) by flow cytometry. Cells were fixed with 4% paraformaldehyde, permeabilized with 90% methanol and the sample was incubated with the primary antibody at a dilution of 1/20. A goat anti rabbit IgG (Alexa Fluor® 488) at a dilution of 1/2000 was used as the secondary antibody. Immunohistochemical analysis of Bak expression in paraffin embedded human stomach carcinoma, using 1/250 unpurified ab32371. ICC/IF image of unpurified ab32371 stained HeLa cells. The cells were 4% PFA fixed (10 min) and then incubated in 1%BSA / 10% normal goat serum / 0.3M glycine in 0.1% PBS-Tween for 1h to permeabilise the cells and block non-specific protein-protein interactions. The cells were then incubated with the antibody (unpurified ab32371, 1µg/ml) overnight at +4°C. The secondary antibody (green) was Alexa Fluor® 488 goat anti-rabbit IgG (H+L) used at a 1/1000 dilution for 1h. Alexa Fluor® 594 WGA was used to label plasma membranes (red) at a 1/200 dilution for 1h. DAPI was used to stain the cell nuclei (blue) at a concentration of 1.43µM. Bak was immunoprecipitated from HCT116 p53-/- cell line whole cell lysate with unpurified ab32371 at 1/100 dilution. Western blot was performed from the immunoprecipitate using ab32371 at 1/2000 dilution. Publishing research using ab32371? Please let us know so that we can cite the reference in this datasheet. The concentration of 1542-1 lot YI063010CS is 0.1160 mg/ml. We recently got an antibody from you, Product ab32371 (Rabbit monoclonal [Y164] to Bak). We are trying to setup the right protocol for this. The datasheet provided with the antibody includes a step of blocking for 1 hr with blocking solution comprising of PBS+10% BLOCKING SERUM. We have never used this step in our lab for any of the antibodies we are using. Please if you could provide us the details as how essential this blocking is, would it affect the staing significantly and in what way if we omit this step. Thank you for contacting us. The purpose of the blocking step is to prevent non-specific binding between the antibodies and the tissue section, membrane, 96-well plate, etc. It is possible to get a good signal without a blocking step, but blocking will help increase confidence that your staining is specific and will improve the quality of your images. If you observe signal when doing an isotype control, that would indicate that you are detecting non-specific signal that could be prevented by blocking. To block tissue sections we recommend incubating them with blocking solution just prior to applying the primary antibody. The blocking should be done after any antigen retrieval or permeabilization. Using 10% normal serum from the host species of your secondary antibody will allow any regions of the tissue that would bind to the primary or secondary antibodies to be coated with antibodies that will not generate signal. For example, if you are using a goat anti-mouse secondary antibody, we recommend blocking with 10% normal goat serum. Additionally, depending on what type of detection you are using, further blocking steps may be necessary. When using an HRP conjugated secondary, it is recommended to use an H2O2 pre-treatment to quench endogenous peroxidases. Similar pretreatments exist for AP and Biotin. There are also additional blocking steps that can be done when autofluorescence is a problem. For more information about additional blocking steps, please see the following reference: http://www.ihcworld.com/_intro/ihc-methods.htm I hope this helps, please let me know if you have any further questions.